NetLogistics Review 2019: Is NetLogistics a Good Hosting? Net Logistics is a provider of top-notch cloud, cloud VPS, and dedicated server hosting products. Their two Australian data centers house high-availability and high-performance servers, and they provide a range of tiered server management packages to keep your solution working smoothly. 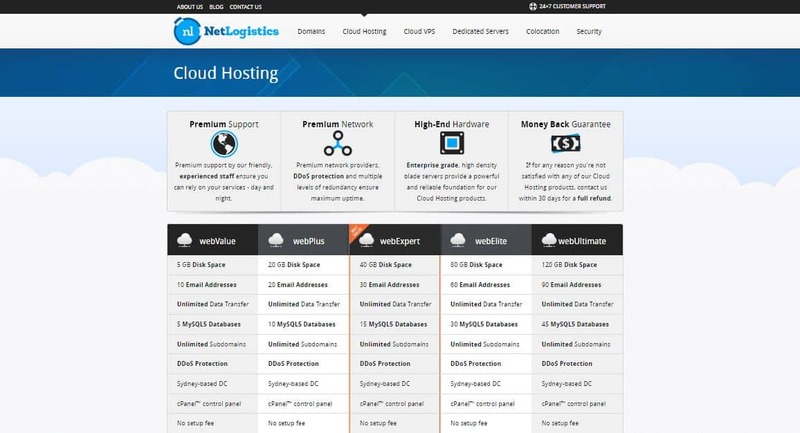 Net Logistics is an Australian web hosting company that specializes in providing cloud, VPS, and dedicated server hosting as well as server management services. Besides being known to provide high-performance business hosting, they are also an auDA, ICANN and Nominet accredited registrar. They operate out of two Australian data centers, in Sydney and Mascot, and their website is in English. Net Logistics’ servers run on high-density IBM server hardware incorporating Intel Xeon processors, DDR3 ECC RAM, SSD storage, and RAID 1/10 with multi-homed bandwidth. The cPanel control panel with Softaculous app installer allows you to install pretty much anything you need on your solution. Depending on your plan, you also have full root access or full FTP access with a web-based file manager. Additionally, you can choose from a huge list of pre-installed applications such as e-commerce and shopping cart software, CMS, and blogware. Net Logistics products come with PHP support, MariaDB and MySQL, .htaccess, plus custom MIME types and Apache handlers. Your plan’s email hosting provides unlimited accounts and email forwarding, SpamAssassin spam filtering, multiple webmail programs to choose from, and built-in anti-virus. Probably their best and most unique features are their extensive hosting management services. For both VPS and dedicated server plans, you can choose from multiple tiers of management services that range from doing it all yourself to having the management of your server taken care of completely. So, even they don’t provide application-specific hosting products, your hosting experience can be made effortless if you have sufficient budget. Cloud plans come in five flavors, each of which includes a cPanel license and no setup fee. You can opt for quarterly, semi-annual, annual, or biennial billing, but the financial benefit for biennial billing is only about 16%. If you then want dedicated SSL/HTTPS or automated daily backups, you’ll have to pay extra. Cloud VPS plans allow monthly or yearly billing with no discounts. For these plans, you first choose between self-managed, managed, and fully-managed hosting, then add one of three resource boosters (of which the standard pack is free). CentOS and cPanel are free, but you’ll have to pay extra for Cloud Linux 7. Paid-for live monitoring services are also available. Dedicated Server plans allow you to choose from four varieties with monthly or non-discounted yearly billing. All plans come with at least basic management services backed by an SLA, and you can add extra packages to compose a more complete managed hosting package. Other things you can add are fully-managed DDoS protection and additional Dedicated IPs (annual). A domain is not included in your hosting price, and although this company’s domains seem quite expensive, they come with privacy protection and DNS management. The takeaway message for pricing is that Net Logistics’ prices are quite steep, even by Australian standards. While they do provide quality products, so do some other providers at lower prices. Support is a bit of a mixed bag unless you opt for their managed hosting services. The 24/7 support staff can be contacted by ticket or by calling one of their two telephone numbers (Australian and International). Their knowledge base and its associated step-by-step tutorials are not as comprehensive as I would like. Although there is no disputing the quality of Net Logistics’ hosting products, management services, and included features, you do have to pay higher-than-average prices for these privileges. They do, however, still present an attractive offering for enterprise customers. Wondering how NetLogistics stacks up against other Web Hosting companies? Enter any other Web Hosting company and we will give you a side-by-side comparison.